CHICAGO—There are times in one’s life where the the shear beauty and inner quality of an experience makes one want more. Shen Yun Performing Arts, a traditional Chinese arts, dance, and music company is often described as an once-in-a-lifetime experience. Once seen, people want to be filled up with its energy again and again. Shen Yun is celebrating its 10th anniversary and was formed to introduce to audiences around the world a lost ancient culture. It’s dance stories and music draw upon 5,000 years of history, legends, literature, and true Chinese arts. Each year a totally new production is performed. Ms. Elkin came to see Shen Yun perform with her daughter Terry Goldman, a vice president of Dukane, a manufacturing company that she has been with for over 35 years. 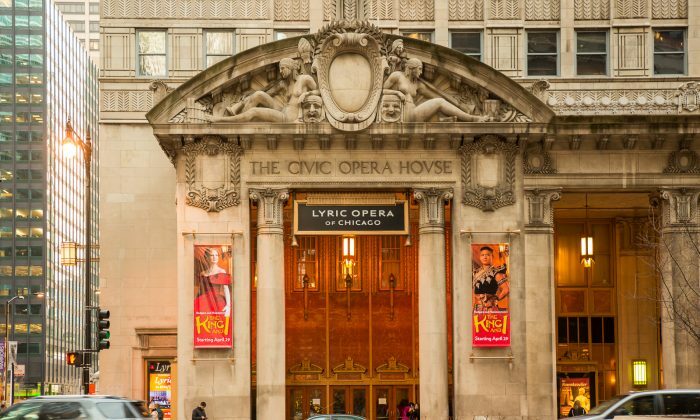 They saw the show at the Civic Opera House on March 15. “The music is beautiful,” said the music teacher. Shen Yun’s orchestra performs original music which has traditional Chinese instruments such as the erhu and pipa leading the melodies among the full Western orchestra of strings, woodwinds, and brass. This effect enhances the story telling of the dances, while, at the same time, makes a unique sound. It was Ms. Goldman’s first time seeing Shen Yun. It is “beautiful dancing, beautiful music—lovely,” she said. Shen Yun originated in 2006 because the communist regime had almost completely destroyed traditional culture with its campaigns like the Cultural Revolution and its state-sanctioned atheism. Several artists came together in New York to form the company and because they worked outside of China, the traditional culture could then be expressed to its fullest. Traditional Chinese culture was immersed in the belief in the divine and the harmony of Heaven, Earth, and humankind. Associated virtues, such as loyalty, kindness and bravery, are shown in the story-based dances. “I have a very dear friend who lives in China, and she has been under communist regime. So, I know,” said Ms. Elkin. Her mother, said she had studied China all her life. “I have always been interested in Chinese culture, so this has just been confirming everything that I have read and learned,” said Ms. Elkin.